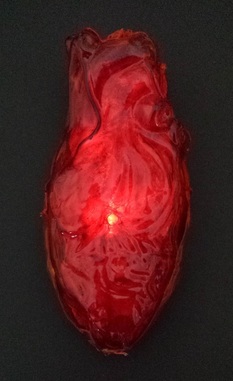 Melting Mirror created this creepy and lifelike glowing heart with TranspArt and shared the process with us! Want to be a villain in the Once Upon a Time universe but you don’t want to get your hands dirty? Well, I have to tutorial for you! In a pot – specifically used for dyeing and not one you’ll eat in later – bring water to a boil, add dye and intensifier. Mix contents until dispersed then bring to a simmer. 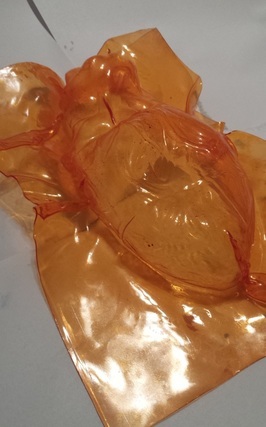 Add one sheet of TranspArt and let soak while keeping it submerged. Keep in water for about 10 mins or until TranspArt is properly tinted. Then repeat for the second piece. ​Preheat the TranspArt till it’s soft. 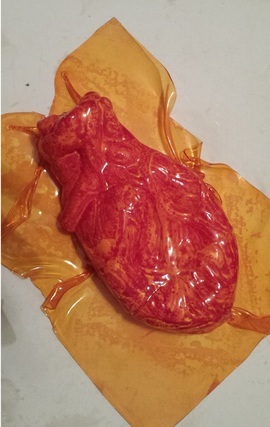 Start up the vacuum and place the hose below the hole, place the heart over the hole and the TranspArt above that. Use the heat gun to continue to soften the TranspArt. It will reach a point where the plastic will stick to the cardboard on all side and the last of the air will be sucked out causing a tight seal. Continue heating till all the folds and creases are defined. 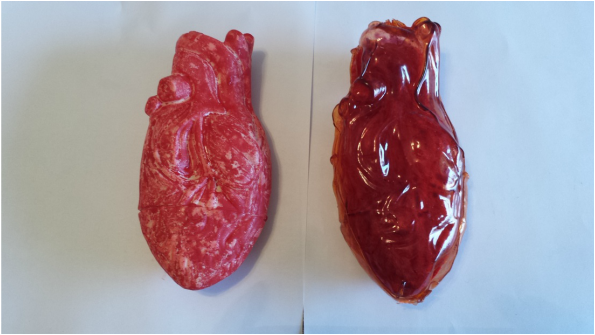 Be careful not to overheat the plastic or else it will bubble and melt. ​Cut off all the excess plastic around the edges. 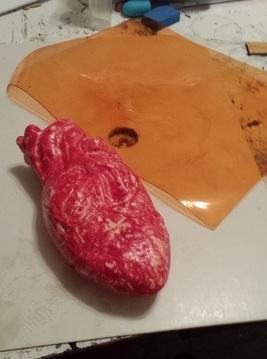 For one piece cut the plastic along the halfway point of the heart. For the other piece leave a little extra so that you can overlap the pieces essentially snapping them together so that you don’t need to glue them together. 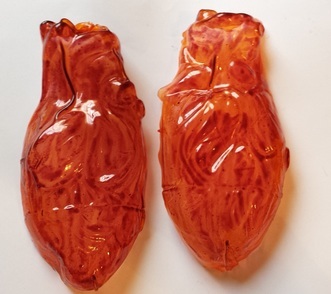 ​Paint the inside of the TranspArt with glass paint – I use Pebeo Vitrail paint – to define the details. I used a dusty pink colour, but anything pink, orange, or red will do depending on the look you are going for. Let dry for 8 hours.